1. Mary was not a good wife. Don't cry over her. There are plenty more fish in the sea. 2. Stop flirting with my boyfriend and find someone else! There are plenty more fish in the sea. Ann: I'm not very good with children. Sue: No, don't be silly. You are a great babysitter. Tony: She knows that. People in the neighbourhood are always asking her to take care of their kids. She is just fishing for compliments. Overfishing is changing the type of fish in the sea, according to scientists at Bangor University. Because larger fish are being caught, they cannot pass on their genes to a new generation. 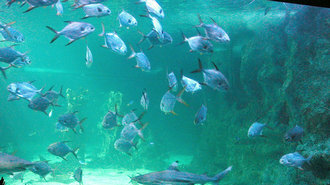 As a result, only smaller fish are surviving.